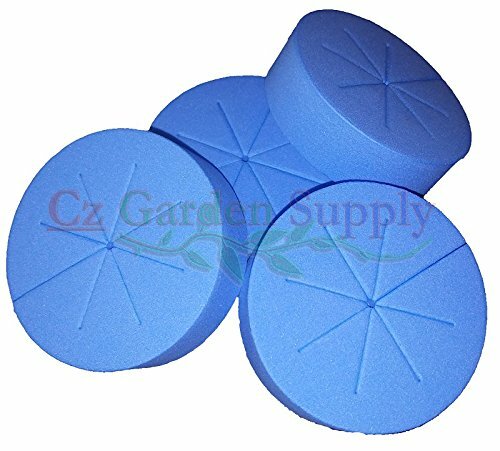 FINEST CLONE INSERT COLLAR REPLACEMENTS - 25 COUNT - BLUE COLOR. Our cloning collars are the best on the market. We're proud to be Amazon's Choice and Best Seller. These are perfectly sized for 3 inch pots with the collar measure at 72mm x 19mm (2.83" x .75")They slide right in making your job super quick and easy. This is the ultimate for plant germination whether you're using a Clone Machine or are a dedicated DIYer. NEW IMPROVED SPOKE DESIGN originally designed by Cz Garden and now copied by several competitors! Features 8 clever slits and 1 hole to cushion tender cuttings. Get the original! 100% MONEY BACK GUARANTEE ensures this will be your best bet for an exciting no-risk purchase. Many customers are so impressed with our quality and design they return to buy several more 25 sets. GUARANTEED LOWEST PRICES Cz Garden manufactures and distributes our cloning collars. We are will beat anyone's prices on any order amount, large or small. * 25 BLUE CLONING INSERT COLLARS at the preferred BLUE 72mm x 19mm (2.83" x .75"). These are the ultimate replacements that perfectly fit 3 inch net pots. These are available exclusively from Cz Garden Supply. US Trademark, USPTO, and Amazon Brand Registry Protected. Get the original!